Scott Pruitt, the head of the U.S. Environmental Protection Agency (EPA), suggested in an interview Tuesday that humans "flourished" during warm periods and climate change might not be so bad. "We know that humans have most flourished during times of what? 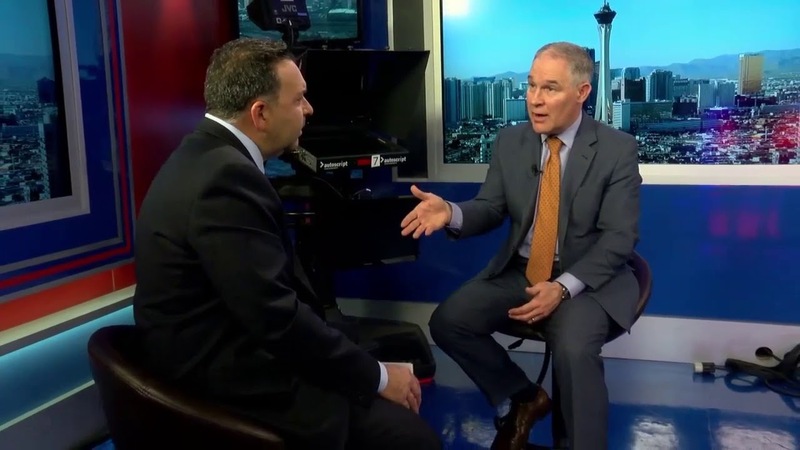 Warming trends," Pruitt told Nevada news station News 3. "So I think there's assumptions made that because the climate is warming that that necessarily is a bad thing." Ironically, Pruitt's remarks were made after News 3 host Gerard Ramalho listed a slew of very real and very dangerous climate-related consequences to the EPA administrator—southern Nevada has felt one of its hottest summers and warmest winters ever, the polar ice caps are melting, sea levels are rising, and hurricanes and tornadoes are intensifying. Pruitt's gaffe is comparable to the time he said carbon dioxide is "not a primary contributor" to climate change. But it is. It just is, as the overwhelming majority of climate scientists have concluded. "As the evidence becomes ever more compelling that climate change is real and human-caused, the forces of denial turn to other specious arguments, like 'it will be good for us,'" Penn State University climate scientist Michael Mann told the Guardian, which first flagged the interview. "There is no consistency at all to their various arguments other than that we should continue to burn fossil fuels," Mann added. Pruitt, as well as his oval office boss, continue to ignore scientific fact as they roll back one environmental protection after another—including the Obama-era Clean Power Plan that slashes emissions from coal-power plants—to push for fossil fuels. "There was a declared war on coal, a war on fossil fuels," Pruitt said during the Nevada interview. "The EPA was weaponized against certain sectors of our economy and that's not the role of a regulator. Renewables need to be part of our energy mix, but to think that will be the dominant fuel is simply fanciful." Pruitt has long been criticized by environmentalists for his close ties to the fossil fuel industry. The former Oklahoma attorney general has famously sued the EPA more than a dozen times to block clean air and water safeguards. Also in the chat, Pruitt insisted again that he wanted to "debate" climate science. "I've talked about having an honest, transparent debate about what we do know and what we don't know, so the American people can be informed and make decisions on their own." The Pruitt-headed EPA has called for a televised "red team blue team" debate between climate scientists and climate skeptics. But there is no debate. Climate science is accepted by lawmakers around the world, who came together under the 2015 Paris agreement to fight the global phenomenon (which Trump is pulling out of, of course). Various federal agencies also recognize the consequences of our warming world. 2017, one of the hottest years in modern history, was also an extremely costly year. According to a January report from the National Centers for Environmental Information, a division of the National Oceanic and Atmospheric Administration (NOAA), "the U.S. experienced 16 weather and climate disasters with losses exceeding $1 billion, with total costs of approximately $306 billion—a new U.S. annual record." The U.S. Department of Defense also released a report last week concluding that nearly half of U.S. military sites are threatened by the extreme weather linked to climate change. "Changes in climate can potentially shape the environment in which we operate and the missions we are required to do," the department said in its report. "If extreme weather makes our critical facilities unusable or necessitate costly or manpower-intensive workarounds, that is an unacceptable impact." Someone should tell that to the man who's trusted with protecting our environment.